So one of my professors at CSU has been researching Bunya pine seed germination. Here's what he told us: The seeds are Cryptogeal meaning they germinate outside the soil - So placed on top of simple potting mix. The seeds cannot be dried out if moisture content drops below 30% the seed will be inviable. The embryo will grow quickly after "planting" pushing a root stem cell into the soil from the seed and transferring all the nutrient in the seed to a ribosome. From here the a sprout appears onto of the ribosome and the tree grows as normal! Hope this helps someone out! Hey all! Learning about this in Botany at uni... I had never heard of it and it is incredibly interesting once you get your head around it! https://simple.wikipedia.org/wiki/Alternation_of_generations Was happy to find some Haploid Gametophytes growing on the side of this plant. Enjoy! Comment your thoughts! Very niceee how slow do they grow? Didn't know about that 30 deg rule, will they stay dormant until then? If time and the universe is infinite then the probability of the creation of a protein is 100%, right? Treated a few seeds! Now the waiting game, hope the new greenhouse helps get those temps up Thanks so much for the info! 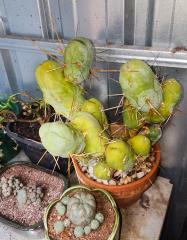 Never tried d.gangeticum but would love to sort something out with you next time you get your hands on some!